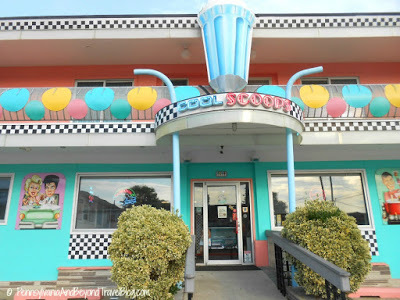 Three years ago we stumbled upon the Cool Scoops Ice Cream Parlor in Wildwood, New Jersey and it has quickly become our favorite ice cream shop at the Jersey Shore. They have some of the best ice cream cones, sundaes, milkshakes and banana splits in the entire state! They were featured on the Travel Channel a few years ago as a place to visit. As soon as you pull into the parking lot you'll see that this ain't no ordinary ice cream parlor. It is totally decked out in a 1950's theme inside and out! If you would like to see some photographs of the inside and learn more about the type's of items that they serve, I invite you to read our previous feature on Cool Scoops right here on our travel blog. Today we wanted to highlight them again, but this time we're focusing on their beautiful wall murals that are painted on the outside walls of their buildings. The wall murals were painted by MG Signs, a New Jersey company that has done hundreds of outdoor wall murals up and down the coast. We've documented many of their wall murals over the years and you can find some of them on the blog by visiting our Street Art section. The wall murals are done in a 1950's theme which we just love! The waitresses are wearing roller skates with the guys wearing saddle shoes! The type of scenes you would see when you would of pulled into a 1950's drive-in restaurant. The artistic murals coordinate with their inside decor and the color scheme is typical of what you would of seen during the 1950's. Each mural is life-size and quite large in size. Aren't they fun? They are so eye catching when you're driving by and definitely worth a look-see if you're visiting the Wildwoods island. Yes, Wildwood is a barrier island off the southern New Jersey coast! Plus, you'll find that they have the BEST hand-dipped ice cream in the state! Note: You can double-click on each photo to have it automatically open up in a new browsing window and in an enlarged size. This will allow you to see the details up close, while keeping our travel blog mobile reader friendly. Thanks!